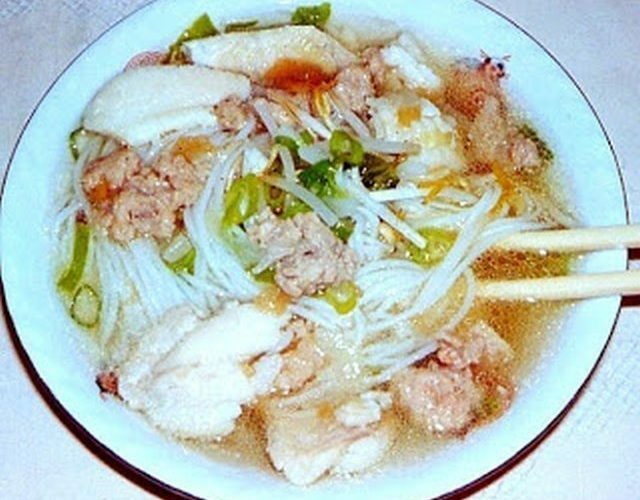 Delicious authentic Khmer​​ seafood noodle recipe with fish, grounded pork and shrimp. Cook 8 cups water in a large pot till water bubbling, add noodle to boiling water and cook till noodle tender. Pour cooked noodle in a colander, rinsed under cold water and set a side to drained. Boil 6 cups water in a large soup pot. When water boiled add fish and cook till fish tender, removed cooked fish from soup stock and put it in a bowl. Using a fork to break up fish filet in to small chunks, when done set a side. Add preserved cabbage in the soup stock, keep soup stock simmering in low heat. Heat up a small skillet. When skillet hot, add oil, saute’ garlic, yellow onion and grounded pork, stirs well. Seasoning meat with fish sauce, sugar, salt and black pepper. When meat cooked add shrimp, stirs till shrimp turns darker pink color, put stir-fry meat and shrimp in soup stock, simmering till soup boiling, add cooked fish, stirs well, keep soup simmering on stove before serve. In a large bowl, mix bean sprouts, cucumber and mint leaves together, and set a side. Put some mixed vegetables in a bowl, add cooked noodle on top, pour hot soup over and top with chopped green onion. Serve hot along with chili pepper and slice of lime.